MelanieTM Coverage is a tool for scientists involved in the development or use of immunoassays aimed at monitoring Host Cell Protein (HCP) impurities in biopharmaceutical products. It is designed to analyze coverage, i.e. the percentage of immunodetection that an antibody reagent offers for the total population of HCPs. 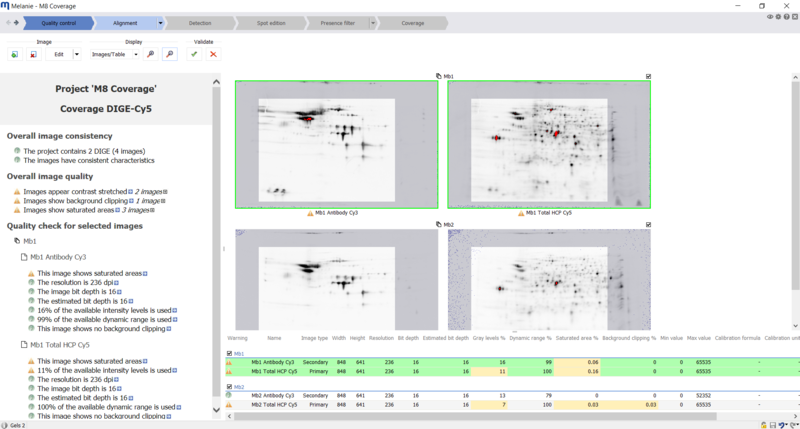 MelanieTM Coverage is based on 30 years of image analysis experience at the SIB Swiss Institute of Bioinformatics where the MelanieTM software is constantly improved and maintained. This new Melanie module is entirely and solely focused on coverage analysis, with a specific workflow and dedicated tools developed in collaboration with GE Healthcare and major companies in the biopharmaceutical arena. 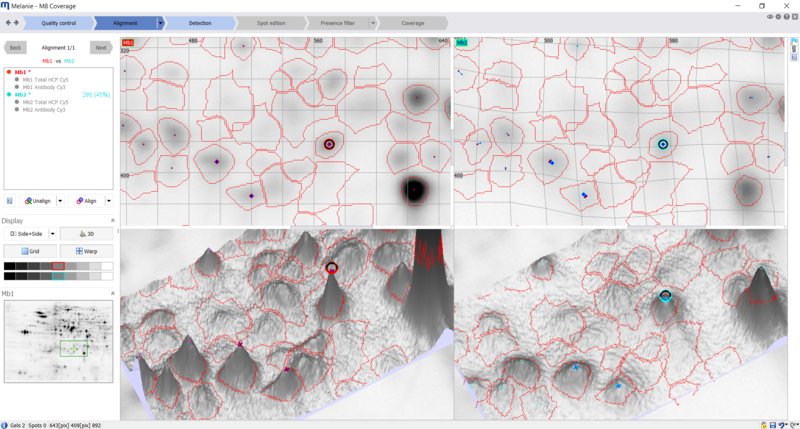 MelanieTM Coverage offers significant time savings over current solutions due to the simple workflow and three-level spot filter that classifies spots based on thresholds as absent, present, or uncertain while allowing user editing. For the commercial environment, the main advantage is reproducibility achieved by the combination of experimental design and savable workflow parameters. 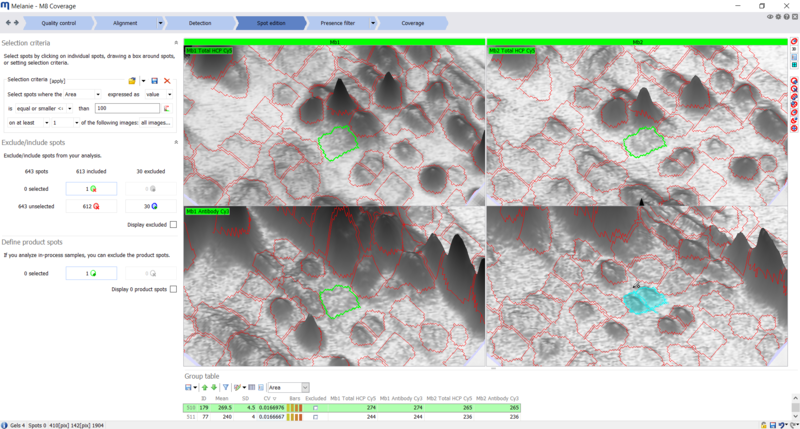 3D view assisted image alignment leads to an unprecedented accuracy in comparing spots between total HCP and probed HCP. The interactive 3D view further provides valuable context wherever user decisions are required. Thus, MelanieTM Coverage provides fast, reproducible, and accurate coverage results to validate antibody reagents for their intended use. 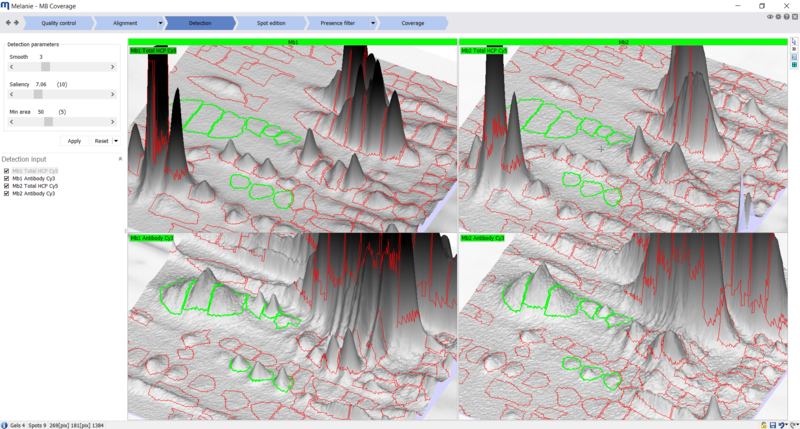 MelanieTM Coverage guides you through the image analysis process with a user friendly step-by-step workflow, delivering quick results. Quality control Check the quality and consistency of your images. Import images. Replicates of HCP-antigen/anti-HCP antibody image pairs can be analyzed as part of the same experiment. Verify Melanie’s automatic image quality feedback. This helps decide whether your gels or blots need to be re-scanned or edited. Alignment Align images to remove positional variation between gels. Align the images from different gels or blots. Then systematically review each alignment pair using the dedicated tools and edit matches where necessary. Detection Detect and quantify spots on all images. 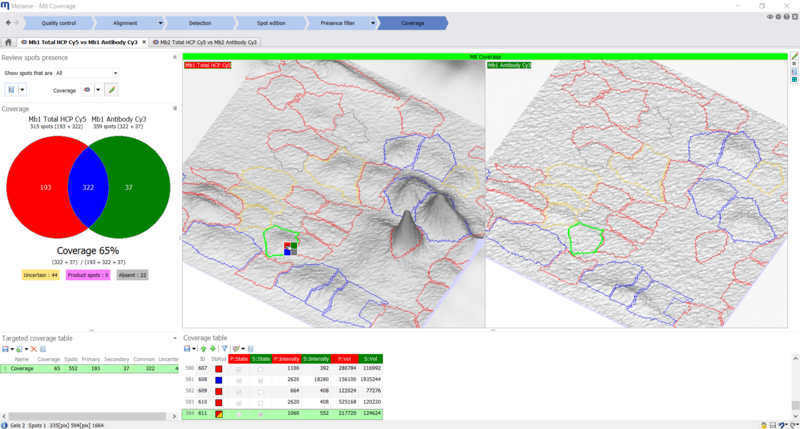 Fine-tune the detection parameters and select best images for the generation of the spot pattern. Either only HCP-antigen image(s) are used to determine the single spot map, or the anti-HCP antibody image(s) are included as well. Spot edition Review and edit the spot pattern. Select spots either manually or based on advanced filter criteria, to include or exclude them from further analysis. Edit spots in the 2D or 3D views across all images to reduce bias. Presence filter Filter spots on each image. Filter spots on every image based on two abundance thresholds to categorize each spot as absent, present, or uncertain. Alternatively, the two thresholds can be set to the same value to classify each spot as either absent or present. Coverage Explore and visualize percentage coverage. 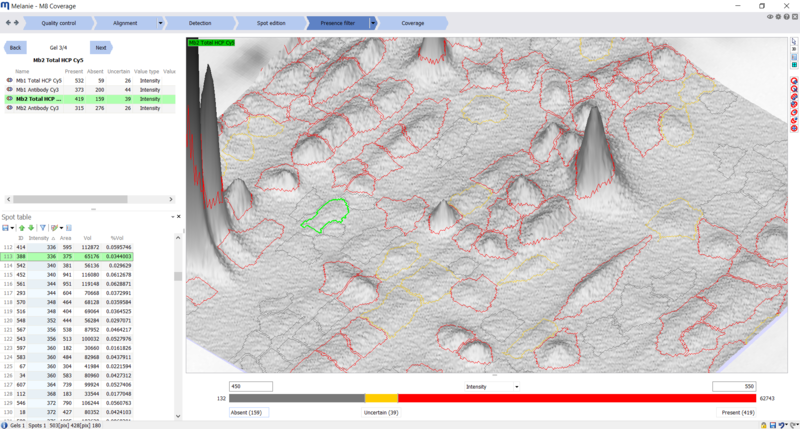 Easily review uncertain spots using the 3D view and table, and set their appropriate coverage with a single click. The percentage coverage and Venn diagram are instantly updated. When several image pairs are included, pair-wise comparisons can be chosen to be displayed in a summary table and histograms. Coverage can also be analyzed for a specific target area – for instance to compare coverage in the high molecular weight area of the images only. This new module of the MelanieTM software is now available from GE Healthcare and GeneBio !